Lucy Lawless: Warrior Princess wanted a Xena: Warrior Princess reboot, and then she maybe didn’t, but too bad! According to The Hollywood Reporter, a reboot project is already in the works. On Wednesday night at NBCUniversal’s Television Critics Association press tour party, NBC Entertainment chairman Bob Greenblatt confirmed that Xena is returning from the dead. “Yes, we’re in the early stages of developing a new take on Xena and we’re looking for a writer. We want to do it,” Greenblatt said. According to THR, sources say the modern take on Xena would have to have the charisma and charm of Lawless and the smarts of Katniss Everdeen. Locking down the charisma and charm of Lawless without, well, Lawless, sounds like a tall order, and as of now it’s very unclear if she will be part of the project. Greenblatt confirmed “there is a deal with Sam and Rob Tapert to produce, and it’s with NBC International.” But according to Lawless, she and her husband Rob Tapert, along with his producing partner Sam Raimi, aren’t involved in whatever is currently brewing at NBC. Greenblatt said he’s only open to Lawless having an onscreen role on one condition: “We’d love to have Lucy be a part of it—if we felt that her presence didn’t overshadow the direction we take with it. I’m not sure how she could be part of it if she wasn’t playing Xena, and I don’t know if that’s a direction we’ll ever go,” he said, adding that he’s open to the possibility of her working creatively behind the scenes. Greenblatt noted that it’s too early to determine what the focus of a new Xena will be and that a lot will depend on the vision of the yet-to-be-hired writer. “I don’t think it’s just a continuation, but we haven’t gotten that far. I think it’s a great character, and we should try to figure out how to revive it somehow,” Greenblatt said. So Greenblatt wants to revive Xena without Xena. And what about her gal Gabrielle (Renee O’Connor) and her gal pal Alti (Claire Stansfield)? It definitely sounds like NBC is going the full reboot route instead of a continuation/revival route, as is being done at Fox with The X-Files and at Showtime with Twin Peaks. 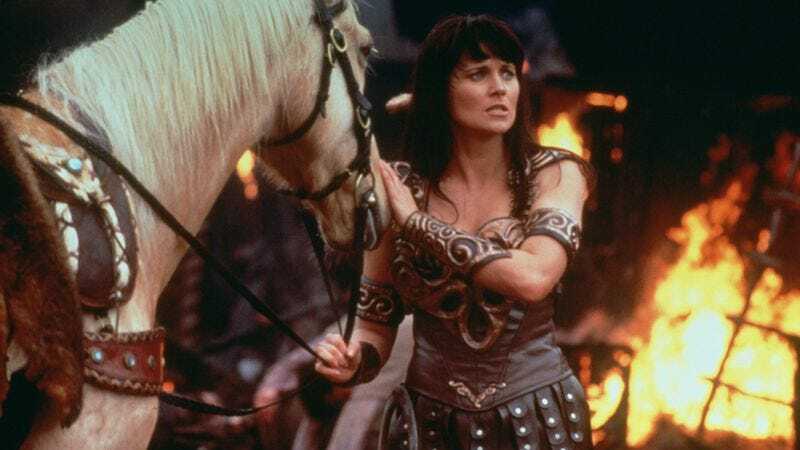 The new Xena series—which may or may not have Lucy Lawless because NBC doesn’t seem to understand what makes the original series so great—is being eyed for 2016.